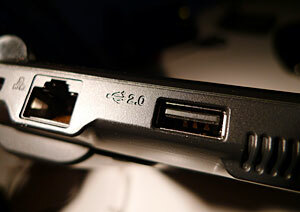 Asus Eee 901 XP edition netbook reviewed - photos, tests and photos. After a near-Olympian bout of advanced pondering and spec-sniffing - as witnessed in our recent Looking For The Ultimate Netbook feature, we finally plumped for the Asus Eee 901. The laptop - available in a black or white sparkly finish - comes with a case so shiny and attractive to fingerprints that Asus thoughtfully provides a cleaning case in the box, along with a neat neoprene sleeve. 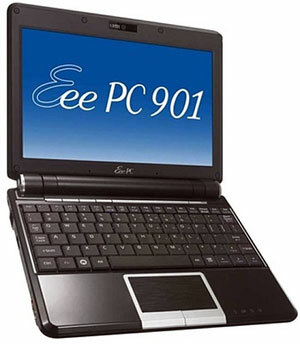 Flipping the 901 open, there's a the same 8.9-inch, 1,024 x 600-pixel display and keyboard seen on its predecessor, the Eee 900, with a slightly more robust looking hinge. 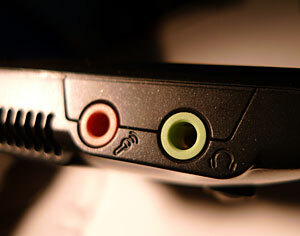 Underneath the lower part of the screen bezel can be seen twin 'array' microphones, which apparently helps the 901 better understand voice commands. The first impressions are favourable - the sleek, curvy lines give off a positive impression, the 1.1kg weight means that you'll have no problem carrying it around all day, and the delightfully small power adapter adds to the overall impression that this is a package that has been well thought out. Above the keyboard to the left can be found four new shortcut buttons. These let you deactivate the screen backlight, cycle on-screen resolutions, launch Skype or run through the four pre-set performance modes of 'super performance', 'high performance', 'auto high performance' and 'power saving'. Plugging in the mains automatically switches the Eee to 'auto high performance' mode. A bright blue, LED-backlit power button ensures that you'll have no problem working out if it's on or not. 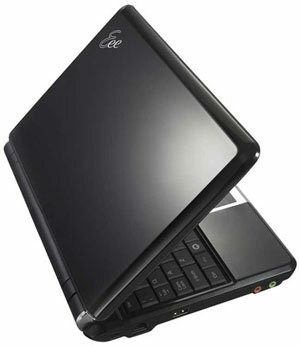 The netbook is powered by an improved Intel N270 Atom CPU, clocked at 1.6GHz, and comes with 1GB of RAM fitted. There's only one DIMM slot, so we had to lob out the 1GB chip and replace it with the 2GB DIMM chip when we upgraded the machine. Installing the RAM was an easy process, however. As we said earlier, the 901 comes in two varieties with the Windows XP model getting a reduced 12GB of storage compared to the 20GB that comes with the Linux model, but Asus sweeten the pill by offering 20GB of free online backup space, courtesy of their Yo Store. There's also the option to increase storage by adding a SD card into the SD card reader on the right side of the laptop. We added a 16GB card, taking our total capacity to a 28GB which should be enough for our daily needs (you can always pop in a memory stick or portable hard drive if you need more). We found the Eee pretty much perfect for our basic surfing, photo viewing and emailing needs. The netbook also played back YouTube videos smoothly, although it could sometimes slow down when transferring large files. The keyboard is rather smaller than we would have liked, and it took a fair bit of getting used to before we could knock out emails without constantly referencing the 'backspace' key. The battery life however was fantastic, and after three hours of solid Wi-Fi activity, there was still well over two hours showing on the taskbar. One thing to watch out for: when we were surfing in bed (well, we had a hangover) it was easy to obscure one of the heat vents with a blanket. Although the machine didn't feel that hot to the touch, it cut out several times until we worked out what was causing it and reluctantly moved our beer-weary asses and sat at a table instead. Although the 901 scored low marks for its cramped and fiddly keyboard, it just about excelled in every other department. The netbook is light and tough enough to lob in your bag and take it around all day, the screen is big and bright enough for everyday tasks and the all-important battery life was truly stellar. 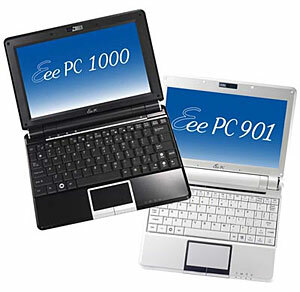 The Asus Eee 901 can currently be picked up on the web for around �280, and at the price we think it represents excellent value. Recommended.